This first thing that needs to be done in order to help you pick the best portable basketball hoop is to answer to one major question, do you want to install a permanent in-ground system or you plan to change location often and get a portable setup. A lot of people choose permanent setups but mobile hoops offering way more benefits because of mobility. Portable systems are offering the same fun as permanent in ground setups so you can play your favorite game and don’t feel any difference, but get benefits of free placement choice. Have you ever been in a situation where the goal is standing right in front of the sun? Doesn’t sound comfortable to shoot a ball if the sun is shining right to your face and you barely can see the hoop while performing the shoot or want to pass the ball to your teammate. Well the solution in such situations is to move to the opposite side of the sun and enjoy the game better with your friends or family. Also portable systems are the best choice if you don’t have much space and want to keep it in the corner of your yard or move it to the garage during the winter time. 3 Types Of Hoops: in-ground, portable, wall-mounted. Silverback NXT is using advanced technology allowing fast assembly. Engineering decisions will allow you to enjoy superior strength, very nice stability that other goals can barely offer. Effortless transportability makes this one our number one pick. Versatile system with solid construction is perfect for all ages and different heights allowing to enjoy the game. One of the best systems available, it has 60' glass backboard and is very stable - allowing to dunk anyway you want, I must say that this is top notch system I have seen so far. Cool graphics on the backboard and nice range of adjustable heights makes it a great starter hoop, buy with confidence. Playing the game with good basketball and using quality hoop is a lot of fun, I’m not even talking that it’s good for your health as you are improving your condition and burning calories. The thing is that most of the time purchasing decision making can be a kind of hard thing due to confusion which hoop to pick. First of all, you need to find out which hoop is right for you. It depends on what main activities you are going to be using it for: just for shooting practice, play 3×3 streetball games, practicing drills with your friends as a team regularly, or just occasional shoot around. Maybe you are looking a nice setup for your children to practice during summer time break? Keep reading and find a some insights to consider about. First thing you need to take care of is to decide where you are going to place it. Keep in mind that safety is the most important thing also keep it away from windows for prevention, also it’s often unsafe to place a hoop in the sidewalk near the road. The main advantage of having a portable system is that it has a large base made from plastic and wheels which helps to move it to a different area, or taking goal with you if you decide to move to another place. If you decide to go with in ground setup, here is what you need to know: such hoops are permanent and requiring cement installation, the main pro is that they are more stable and offer way more safety if installed properly, if the plan is to play aggressively then permanent setup is the only way to go. The third type is losing popularity over time, however, if you are considering to build such setup there is an option to get a combo of rim and backboard. They are quite cheaper because of lack of support pole, but benefit is good backboard performance as it has a support bracket which take all the dunking power. Of course, the these also have limitations and one of the obvious is that there is no height adjustment ability. This feature is very important if you are buying one for your kids, so before buying always check product description for this feature. If it’s available, you can adjust the height so your kids can enjoy the game according to their age. Most of the time, quality systems has option to adjust height from 7 feet to 10 feet as highest, but there are plenty of options with wider ranges. Official height is 10 feet (3.048 m) which is used in all official games. This feature is useful because kids are not strong enough yet to shoot a ball to the hoop which is positioned at official height, getting the rim and backboard in lower position solves this issues and everybody can enjoy the game. The rim is one of the most important parts of any basketball hoop. During last couple of decades rim technology improved a lot allowing high jumpers to perform hard dunks and last longer. The breakthrough came when spring supported rims were introduced. They minimize pressure from the slam and offers improved durability. 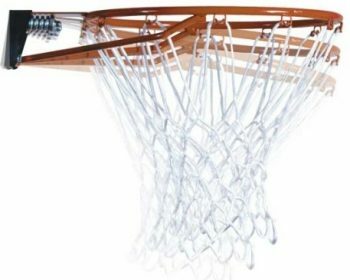 Cheap hoops will not feature such rims with spring mechanism, but if you are not considering dunking, or looking for your teenage kids you don’t need such rim and better save money for a better ball. Cheap ones are not for professional level, mid-level ones already have spring but it’s visible, which leads to rusting. High-end rims have 2-3 spring breakaway mechanism protected with metal cover. There is no magic in there, as rims are major part and the higher quality you can afford the better experience you will have. 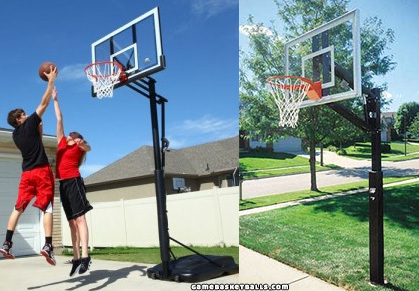 For children who are just starting to play basketball and learning to shoot the perfect size is 44” backboard. 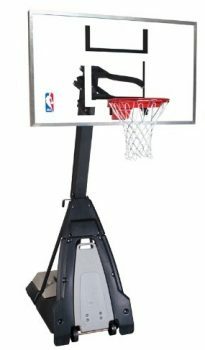 Next, bigger size is for young teens who are starting to drive to the basket and practicing long range shoots, 50” backboard is good due to increased rebound space allowing to get way more shooting skills and different styles. Pro players love large (54-60”) or even official size – 72” backboards. Now lets get clear about material. If you are considering to buy one for your children than graphite and polyethylene are the main materials as they are designed with main focus on children. For beginners and more advanced players you should go with acrylic backboards. The best backboard material is polycarbonate providing high durability and high-end performance. Polycarbonate offers arena-style look with clear glass. High-end tempered glass backboards is a top choice which has combined professional style and the best performance for rebounders and for players who prefer aggressive game. It’s all about popularity of basketball and the biggest impact was caused by NBA – national basketball league was founded in 60s, however it started to gain popularity in the early 90s with Jordan and other hall of fame players. Only small portion of people had the ability to play this game in basketball courts and having such court at home was not common. The solution was in big need and it was found! Industry pioneers Spalding and Lifetime was the first companies who brought portable hoops in to the market and of course with this debut all people gained the ability to have own court in their backyard and enjoy playing basketball using one of the portable goals they released. At first there was only a backboard and rim, in most cases they were mounted on the top of garage door, it was so popular that they kept working on improving the system and came with easily assembled and completely independent setup. Today you can see them in almost every yard and families enjoy playing with ease whenever they want, even offices have them where people can make some shoots during the rest time between their work. These hoops are bringing lots of joy in daily lives of people, as they can play with their kids and friends. As talking about kids, the major improvement was the ability to adjust the height, as a result kids have enough strength to throw the ball and enjoy playing. That caused popularity of portable basketball hoops go through the roof that is still going strong. Today, as such ability to move the goal with ease is getting popular among house owners so are the product availability rises. Each year manufacturers are working to make them more stable by using latest technologies and of course all the new stuff like shot counting integration and all these smart hoop addons. However, you can find cheap hoops or pay extra money for a better quality system which offers more stability and of course wild dunk capabilities because of improved stability. Sometimes it’s best to buy older model cheaper than choose latest one and pay way more. If you are in situation where you have a particular budget and can’t afford latest model, you should go with older one instead of new but lower feature hoop. It’s not rocket science in this you just have to know what kind of hoop you want by the way you play. Finally each hoop has its own pros and cons each family should consider before buying, so read our reviews. Furthermore, we also recommend to check latest feedback from people who bought one and already enjoy using. You should always read reviews before buying to get the best value for money, we did that for you and listed here the best choices among thousands of happy consumers. Rating of the product adds a lot of value to the decision on picking the best, but this is not the final aspect to pay attention to, it depends on how you are going to use it and with whom.